Today we have been given an interesting challenge by our teacher. This challenge was to create a DLO in ten minutes about the different continents in the world, and the countries that live among those continents. Once we had created the DLO, we then could find at least 3 interesting facts about the different continents. The reason as to why we did this challenge was to expand our general knowledge about the world and different continents. For this activity I worked with Joseph and we had a lot of fun finding facts, and finding information. 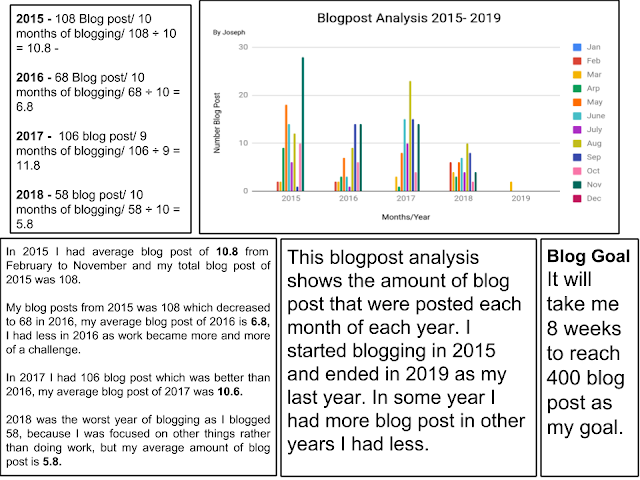 This blog post analysis was created on a google sheet, it shows how many blog posts I have posted every year and month. In 2015 I blogged 108 and in 2016 I blogged 68 blog posts, that shows that I have blogged in some years less and some years more. 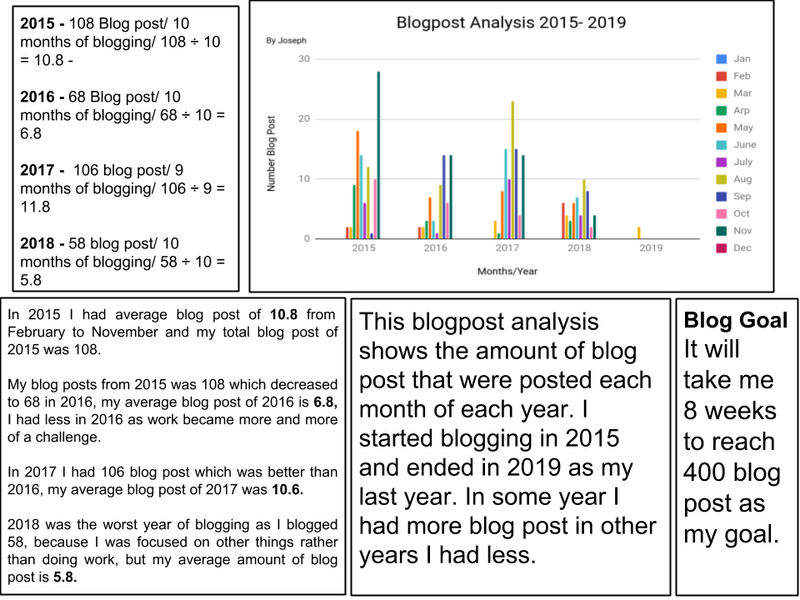 I also showed the layout of how I got my average blog post a year. What I found interesting is that there was a pattern going on each year, in 2015 it was over 100 which is a three digit number, until 2016 it went to 68 which is a 2 digit number, which means it goes to 3 digit number to 2 digit number and repeats again in the same order. Have you ever wanted a detailed sentence? 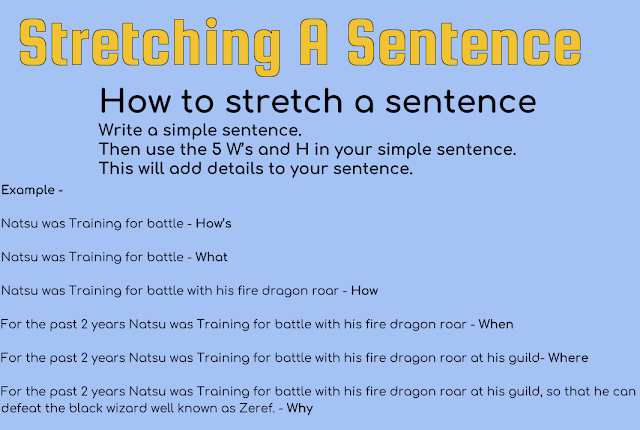 This DLO shows how to stretch a sentence, the purpose of stretching a sentence is to add more details. I also have a written example to show how it's laid out. 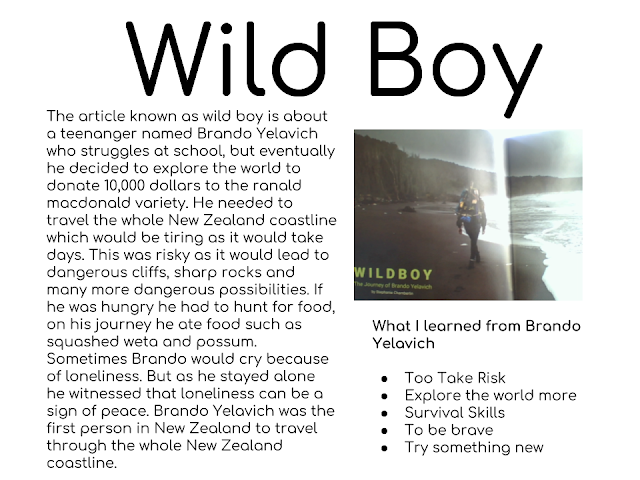 As I read this book, it had many incredible things such as him traveling around the whole New Zealand coastline to donate charity, many tips about survival skills and important life lessons. This DLO shows a summarized text about a teenage boy named Brando Yelavich. Last week, we had to look over at each other's writing sample, for this purpose, we needed to be with a buddy who could give us feedback. My partner was Julian, Julian and I checked each other writing sample, we also had give an honest rating to 1 to 7, and there was 6 different topics. The 6 topics were Punctuation, Vocabulary, Organisation, Sentence Structure, Structure and Language and Ideas. I need to use semicolon, exclamation to show how I am feeling in a Idea, question marks to show Im asking a question, aprosthe and colons..
(Organisation) I need to work on organizing my paragraph correctly and need to link my ideas. (Sentence Structure) I need to work on my writing formal and need to use complex and simple sentences more often. (Structure and Language) The structure of my writing needs to be worked on make sense to reader. He needs to work on using punctuation such as (exclamation mark) to show a similar emotion as anger towards a message, (question marks) to show his sentence is a question, (speech marks) to show when someone is speaking and colons. (Organisation) He needs to work on organising his paragraph and need to improve his paragh linking. He need to work on using simple sentences more often as well as complex. (Sentence and Language) He needs to work on making his writing simple to read. (Ideas) He needs to work on making his Ideas useful. Have you ever seen a Plastic Bags cause a Huge Problem? The problem with this environment is that Plastic Bags are littered by people, this huge problem of plastic bags has caused the death of sea creatures. This is really unfortunate to Sea Turtles as some have suffered with unequal turtle shells due to the Plastic Bag attached to they're neck and shell. This could extinct different types of turtles. Plastic Bags have also has caused over 1 million sea animals to die including sea Turtles. The other problem about Plastic Bags is that it absorbs the oxygen of food source. This is why shops are banning Plastic Bags which is a really good idea to avoid sea creatures suffering. You can stop this problem by using a used Plastic Bag, although even if you avoid this problem, plastic bags take 400 years to break down. Imagine the plastic bags still in the ocean and waiting for a turtle to comeby. At Tech we were doing Meteal Work with Mr Naicker, the first thing we did was Filling out a question form which gives us a choice to choose between a Pizza Cutter or Cake Server. I generally chose Pizza Cutter due to the fact that a large majority of people would rather have Pizza than Cake. I then had to choose a design of how I want my Pizza Cutter to look, I chose a complex design rather than simple design because I think simple designs are plain. I then got my handle for my Pizza Cutter and polished it. 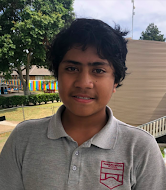 Panmure is my hometown, it is special to me because it has been my childhood place. It is also quiet and calm which makes it even more special to me. I describe Panmure as a fun and a faithful place. It is also a nice happy place with lots of polite people. Panmure to me is the dictionary of wonderful because all the things that were mentioned are true.